Submitted photo Sydnee Hawkins is a member of Greene Acres and will be showing pigs, a steer and a heifer this year at the Greene County Fair. XENIA — Sydnee Hawkins, 12, of Xenia, has spent numerous hours in the barns preparing all year long for the Greene County Fair. However, unlike a number of fair participants, her projects didn’t start at a sale but instead when she brought home some of her gilts and bred them for a litter of pigs the following year. Hawkins, a member of Greene Acres, was in the barn the night the pigs were born and there every step of the way. 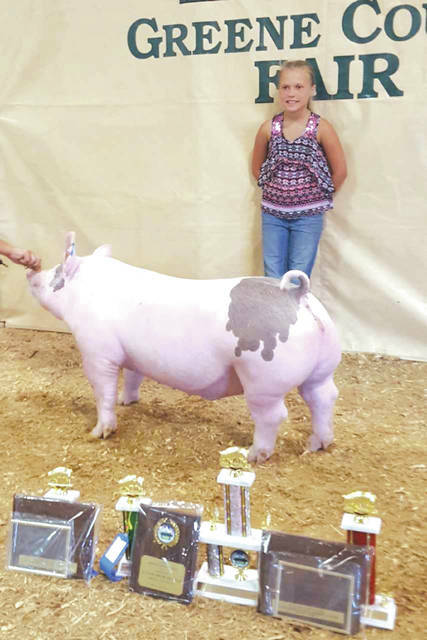 It brought her success last year, as she had two class winners, a division champion barrow, a division champion gilt, reserve champion overall market gilt and fourth overall market hog. She additionally won first place in her age group and showed the sow the previous summer at the fair. However, Hawkins has learned that even with preparation and training, sometimes things don’t go as planned. After experiencing a tough year in the farrowing house last winter, she had to buy her 4H pigs from her aunt and uncle at MVP Showpigs. She describes those pigs as being loving and enjoying being given attention. In addition to pigs, Hawkins also shows steers she raises off her grandfather’s farm. She bought a heifer last year, which was shown at the Greene County Fair last year and earned Hawkins a second place medal in her class. Hawkins’s first calf was born on a snowy day in April and the jet-black animal is ironically named snowflake. She will be showing a market steer from the family farm as well as a heifer. She spends countless hours walking, rinsing, combing and bonding with her steer and heifer and is excited to show them this year at the Greene County Fair. https://www.fairborndailyherald.com/wp-content/uploads/sites/50/2018/07/web1_hawkins.jpgSubmitted photo Sydnee Hawkins is a member of Greene Acres and will be showing pigs, a steer and a heifer this year at the Greene County Fair.